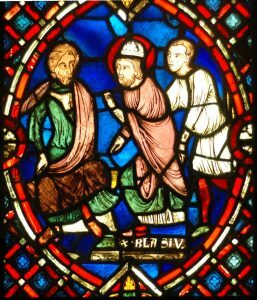 Episodes from the life of Saint Blaise: Saint Blaise living with animals; extracting the fishbone; restoring the pig, and martyred with steel combs. Vitae Sanctorum, Anjou, 14th c. (Bib. Vat., MS lat. 8541), fol. 52v. February 3 in the Roman Catholic calendar and February 11 in the Orthodox one mark the feast day of Saint Blaise, Bishop of Sebaste in Armenia in the early fourth century. 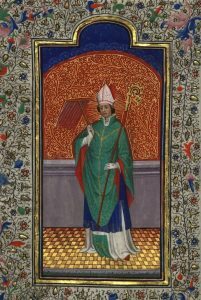 According to his hagiography, Blaise had been trained as a physician before becoming a bishop in the early Christian church, an institution still outlawed in the Roman Empire. 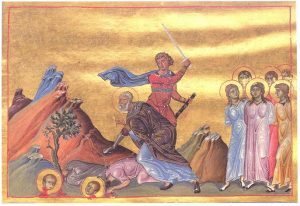 Seeking solitary prayer in the wilderness, he lived peacefully with the wild animals until his arrest by Roman soldiers on the orders of the Roman governor Agricola, under whom he was imprisoned, tortured, and martyred. 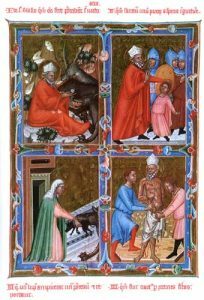 Blaise’s best known miracles include his restoration of a pig to a woman from whom it was stolen by a wolf who returned it on the saint’s command, and the cure of a boy who was choking on a fishbone. This second miracle resulted in Blaise’s designation as the patron saint of those suffering from throat ailments, inspiring the annual tradition of the Blessing of the Throats on Saint Blaise’s Day, also known in the west as Candlemas. 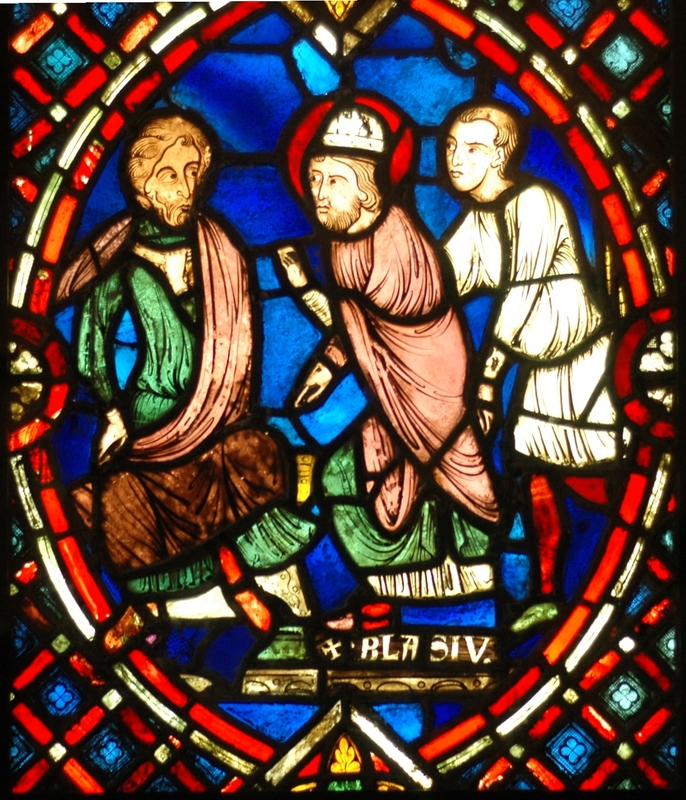 Saint Blaise before Agricola, detail of a stained glass window from the Soissons region, first quarter of the 13th c (Louvre, OAR 504). 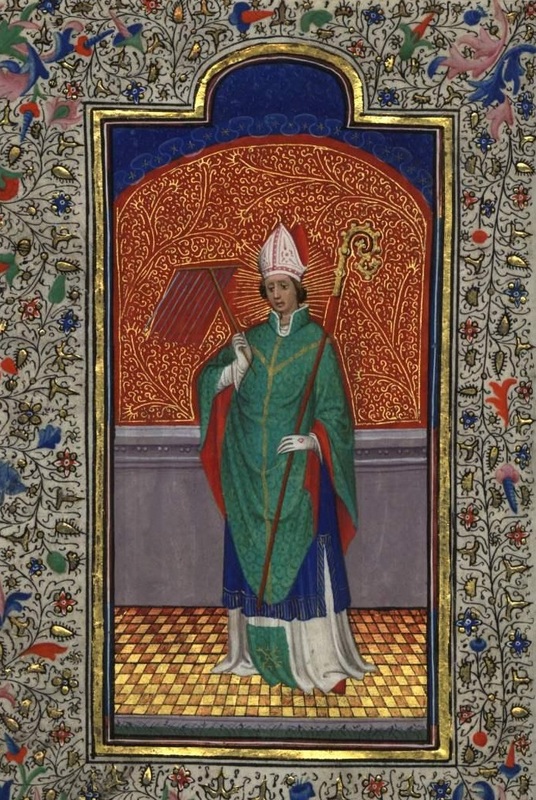 In the Index of Christian Art, Blaise is catalogued as “Blasius of Sebaste.” He is typically depicted wearing his bishop’s robe and miter and holding a crozier. In later medieval art, he often holds a wool carder’s comb, perhaps a medieval reinterpretation of the Roman steel combs with which his flesh is said to have been raked during his martyrdom. Post-medieval images sometimes depict him holding two crossed candles in an allusion to the Blessing of the Throats. His most common narrative depictions show him meditating or ministering among the wild beasts; extracting the fishbone from the choking boy; standing before Agricola; or in the act of martyrdom, sometimes accompanied by the seven pious women who, according to Eastern tradition, followed him throughout his torments, wiping up his blood. Martyrdom of Saint Blaise and his followers, Menologion of Basil II, Constantinople, 10th c (Bib. Vat., MS gr. 1613), p. 390. Portrait of Saint Blaise, Book of Hours of D. Duarte, Bruges, first half of the 15th c (Arquivo Nacional da Torre do Tombo, PT/TT/MSMB/A/L65), fol. 30v.